Dr. Touijer accepts the following list of insurance providers. Select your insurance provider to see more details. I am a board-certified surgeon who specializes in caring for patients with genitourinary cancers, including cancers of the prostate, kidney, bladder, and adrenal glands. I have been practicing at MSK for more than 13 years. My primary focus is on the use and development of innovative minimally invasive surgical techniques — such as laparoscopy, robot-assisted laparoscopy, and image-guided therapies — to treat genitourinary cancers. I am committed to offering all my patients personalized care with the objective of providing the right treatment for the right cancer in the right patient at the right time. To achieve this goal in prostate cancer, I use modern risk-assessment tools such as nomograms; multiparametric MRI, which evaluates the extent of disease; repeat biopsies; and highly sophisticated genomic testing of tumors. In addition, I strive to provide the best outcome for each one of my patients through careful surgical planning, meticulous surgical technique, and selective use of multimodality therapy. I work closely with my colleagues in medical and radiation oncology to determine the best approach for men with high-risk prostate cancer who have metastases to the lymph nodes. In men with low-risk prostate cancer, I often recommend active surveillance (also known as watchful waiting) to avoid unnecessary treatment and to help patients enjoy their quality of life to the fullest extent possible. I perform approximately four to six prostate cancer surgeries a week and about 150 to 200 each year. I’m an expert in laparoscopic and robot-assisted nerve-sparing radical prostatectomy with thorough pelvic lymph node dissection. I also have vast experience in laparoscopic and robot-assisted salvage radical prostatectomies for men whose cancer has recurred after initial radiation therapy. For the treatment of kidney cancer — and in partnership with my patients — I use a risk/benefit strategy based on state-of-the-art imaging, predictive modeling and, when appropriate, needle biopsy data to determine the optimal management of their disease. Treatment options we consider include active surveillance; ablative therapies in which extreme cold or heat are used to destroy a tumor; partial nephrectomy, meaning that only the part of the kidney with cancer is removed, leaving as much healthy kidney as possible; or radical nephrectomy, in which the entire kidney is removed. Minimally invasive partial nephrectomy represents close to 90 percent of the kidney surgeries I perform. To do these surgeries successfully, I have developed with my colleagues at MSK a novel anatomical risk assessment tool to help inform patients about the complexity of the procedure and provide surgeons with a roadmap for the actual operation itself. 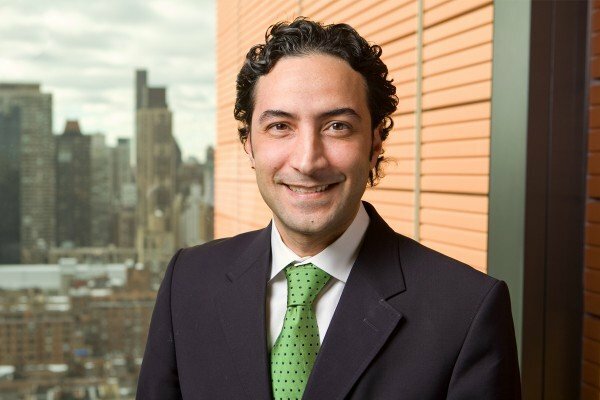 My clinical research focuses on improving surgical quality and introducing new techniques to improve both the performance and outcomes of surgery. From a translational research perspective, I’ve been actively working with my colleagues on MSK’s Nuclear Medicine Service and in our Nanotechnology Center to develop novel molecular imaging tracers that can visualize and distinguish cancer cells from normal cells. This is an important step forward in allowing surgeons to see microscopic deposits of cancer cells and ensure their complete removal during surgery. We’re currently conducting two clinical trials of this exciting new technique. I am a member of the Society of Urologic Oncology, the American Urological Association, the European Association of Urology, and other national and international societies. I teach advanced laparoscopic and robotic surgery to members of the European Association of Urology and the American Association of Urology. In addition, I serve on the editorial board and as a reviewer for a number of peer-reviewed urology and cancer journals and lecture internationally on the role of minimally invasive surgery in the treatment of prostate and kidney cancers. Visit PubMed for a full listing of Dr. Touijer’s journal articles. Pubmed is an online index of research papers and other articles from the US National Library of Medicine and the National Institutes of Health.